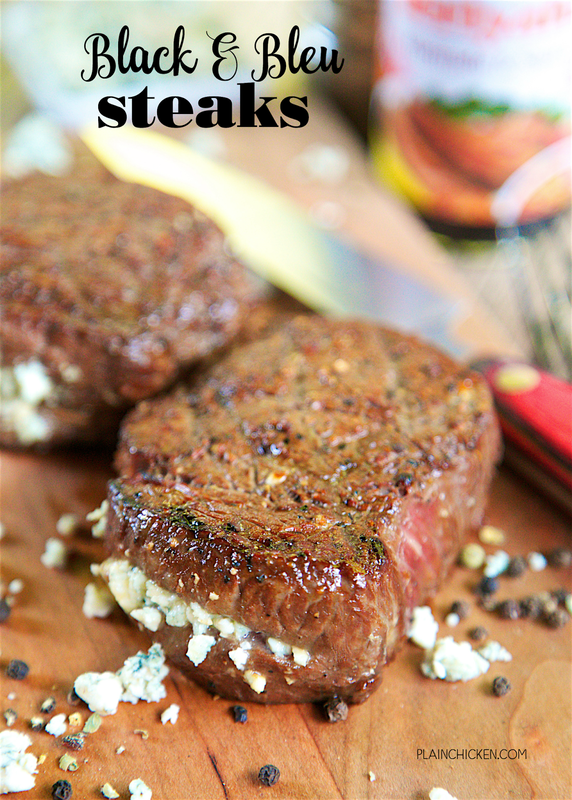 Black and Bleu Steaks - only 4 ingredients to the best steak you've ever eaten! Kikkoman Teriyaki Marinade & Sauce, Worcestershire sauce, black pepper and bleu cheese. Let the steaks marinate all day. Made these for a dinner party and everyone cleaned their plate. CRAZY good! Better than any steakhouse! Steaks are one of our favorite meats to grill at home. I would put our grilled steaks up against any of the top steakhouses in the country. Chicken Legs is a master griller! To cook a great steak, you (obviously) need a good cut of beef, but you also need a really good marinade. You want a marinade that adds great flavor but doesn't overpower the steak. We were having a few people over for dinner last weekend, and I wanted to kick up our usual steaks. I decided to make these Black & Bleu Steaks - USDA Prime Filets coated in fresh cracked black pepper, stuffed with bleu cheese and marinated in our favorite marinade. I was worried that stuffing the bleu cheese inside the steaks would be difficult (I've never stuffed steaks with bleu cheese before). Well, it wasn't difficult at all! I cut a slit in the side of the steaks, pressed the bleu cheese crumbles together and stuffed it right inside. Super easy. It didn't come out when we grilled the steaks either! Success. Our secret ingredient in the steak marinade is Kikkoman Teriyaki Marinade & Sauce. Kikkoman Teriyaki Marinade & Sauce is a blend of traditionally brewed soy sauce, wine, and spices. It has the depth and flavor that makes it an ideal marinade or brush-on sauce, right from the bottle. We like to use it in combination with Worcestershire sauce for a super simple and delicious steak marinade. It gave the steaks the most amazing flavor! Everyone cleaned their plates! CRAZY good! Honestly, a thousand times better than most steakhouses! The steaks can marinade all day in the fridge. I say the longer the better! 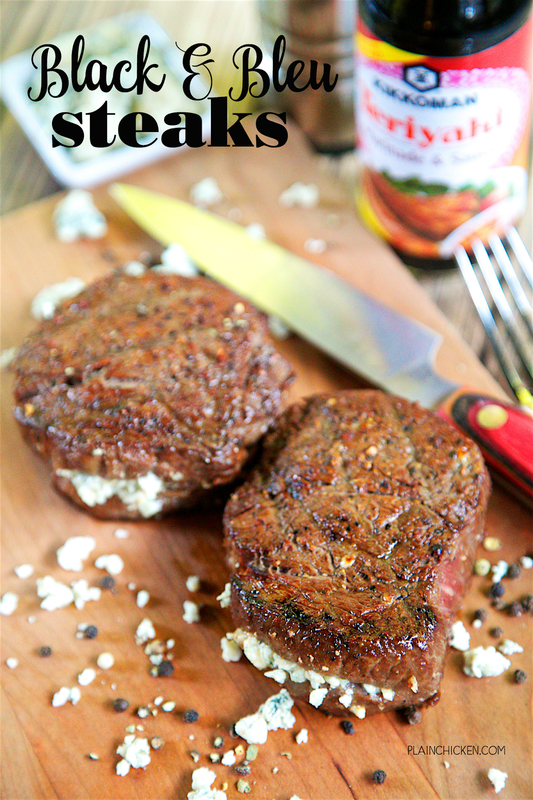 I stuffed the steaks with bleu cheese right before we put them on the grill. I can't recommend these steaks enough. The flavor was fantastic! The Kikkoman Teriyaki Marinade & Sauce really put the flavor over the top. I can't wait to make them again! Coat both sides of steaks with freshly cracked black pepper. Place steaks in a large resealable plastic bag. Whisk together Worcestershire sauce and Kikkoman Teriyaki Marinade & Sauce. Pour over steaks, turning to coat well. Refrigerate at least 30 minutes, up to overnight for more flavor. Turn steaks occasionally. Prepare grill. Remove steaks from resealable plastic bag. Cut a 2-inch slit into side of the steak - do NOT cut all the way through the steak. Stuff each steak with 2 Tablespoons of bleu cheese. 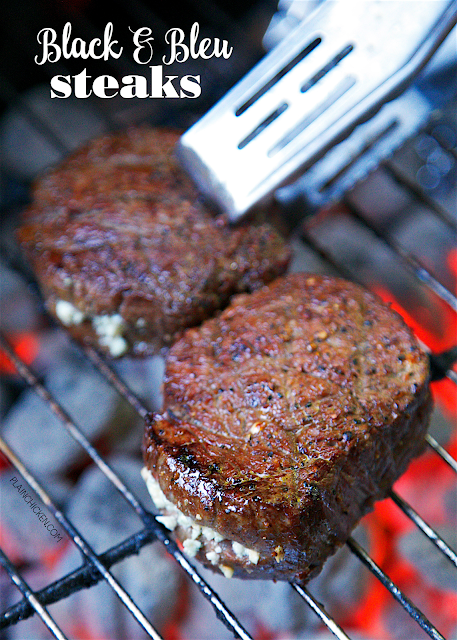 Cook steaks on grill until they have reached the desired doneness. What is your favorite recipe with Kikkoman Teriyaki Marinade & Sauce? Tell me in the comments for a chance to win a $100 Visa gift card! My favorite recipe is teriyaki marinated pork chops and pineapple cooked on the grill. I LOVE all your grilling recipes! I need to try this ASAP. I like to grill skewered shrimp and pineapple. I like to make Teriyaki chicken with the Kikkoman Teriyaki Marinade & Sauce! It makes my chicken taste so good!! I boil ribs and then marinade them in kikkoman before grilling. Delicious! I grill a flat iron steak and marinade it with Kikkoman, ginger, pineapple, sweet onion and sesame oil. I use it in my Japanese eggs...scrambled eggs with sugar and Teriyaki sauce, served with Japanese white rice. 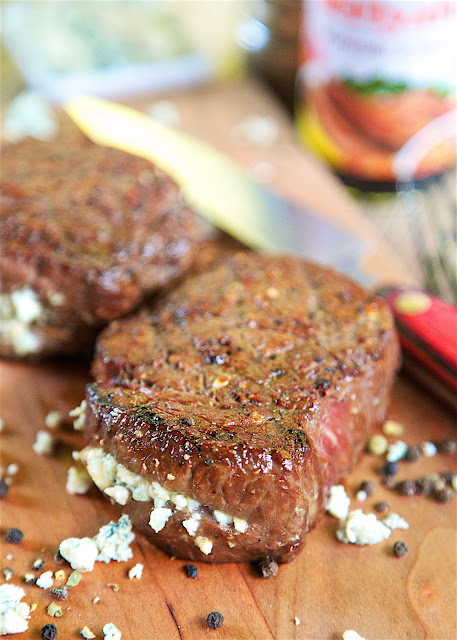 Bleu cheese is a must with our steaks. I always have crumbles in my fridge. I like to use the Teriyaki marinade for my shrimp on the grill. My favorite recipe is grilled teriyaki chicken. My favorite Kikkoman Teriyaki Marinade & Sauce recipe is use it on Roasted salmon. Real yummy! My favorite thing to make with Kikkoman teriyaki marinade and sauce is teriyaki chicken with steamed vegetables. I like the Honey Baked Teriyaki Chicken Wings. I like to marinade chicken in Kikkoman teriyaki sauce and grill it with veggies. My husband makes grilled chicken tenders with teriyaki sauce on our little hibachi grill. So good! I love to add the sauce to chicken stir fry. I like adding Kikkoman teriyaki to our chicken and then cooking the chicken on our bbq. Thanks so much. I like using Kikkoman Teriyaki Marinade & Sauce to make chicken kabobs that I lay over a bed of rice. I shared on Twitter: https://twitter.com/FireRunner2379/status/745334677557362688. I like to pour it over rice. It provides just the right amount of punch. My favorite recipe with Kikkoman Teriyaki Marinade & Sauce is to use to marinade pork chops. My fave is my chicken breast and shrimp. I love to add Kikkoman Teriyaki Marinade & Sauce to my chicken kabobs w/pineapple! I like to make Hawaiian kabobs with chicken, pineapple, pepper,s and onioins. The Kikkoman Teriyaki Marinade & Sauce is delicious. I like grilling chicken and vegetables. I like kabobs with marinated chicken, veggies and pineapple....over brown rice. i like honey glazed teriyaki chicken. My favorite recipe is grilled teriyaki pork, red onion, and pineapple skewers! I take all my leftovers for the week, marinade them over night, then a quick stir fry and my family loves leftover night. I love grilling ribs with it! I love using that sauce on grilled chicken. It is great to put on kebabs - pork, cherry tomatoes, onions, and bacon. I would use the teriyaki sauce on my grilled salmon. 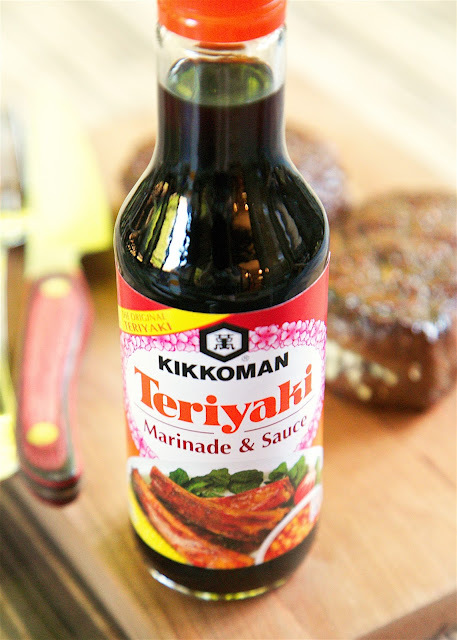 I like to use the Kikkoman Teriyaki Marinade & Sauce for marinading my steak and add mushrooms. My favorite recipe using Kikkoman Teriyaki marinade and sauce is with chicken and vegetables. My favorite recipe for Kikkoman Teriyaki Marinade & Sauce is my shrimp fried rice! I would love to try the Shrimp Po' Boy as I am a huge shrimp fan. i love using it with my steaks! I've never tried Kikkoman before. I love spicy shrimp kabobs on the grill.I'll have to try adding some Kikkoman next time we cook them. I like marinating chicken and pork for stir fry. Teriyaki chicken! But this recipe looks amazing! I like to grill chicken with it. I like to marinate pork chops for a few hours and throw them on the grill. My favorite recipe with Kikkoman Teriyaki Marinade & Sauce is Chicken Egg Pu Yung Hai marinated in Brown Pu Yung Sauce, and topped with plenty of Kikkoman sauce. I like using it for Hawaiian crockpot chicken.